Prof. Harry Laver returns to continue the discussion on the essential qualities of Leadership, leaders who embody them—and some leaders who do not—and his book edited with Jeffrey J. Matthews, The Art of Command: Military Leadership from George Washington to Colin Powell. from Goodreads.com What essential leadership lessons do we learn by distilling the actions and ideas of great military commanders such as George Washington, Dwight D. Eisenhower, and Colin Powell? That is the fundamental question underlying The Art of Command: Military Leadership from George Washington to Colin Powell. The book illustrates that great leaders become great through conscious effort — a commitment not only to develop vital skills but also to surmount personal shortcomings. Harry S. Laver, Jeffrey J. Matthews, and the other contributing authors identify nine core characteristics of highly effective leadership, such as integrity, determination, vision, and charisma, and nine significant figures in American military history whose careers embody those qualities. 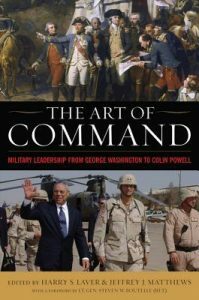 The Art of Command examines each figure’s strengths and weaknesses and how those attributes affected their leadership abilities, offering a unique perspective of military leadership in American history. Laver and Matthews have assembled a list of contributors from military, academic, and professional circles, which allows the book to encompass diverse approaches to the study of leadership.